After I was directed by the Pettavaithalai temple priest to Thirupparaithurai I headed in that direction as I told in my previous post. I came back that long way of 1.5 km to the bus stand and waited for the town bus no.97. It took its own time. Finally it came and I had to stand half the way. I took a ticket to Thirupparaithurai with the least idea as of where to get down. I passed through Perugamani, about which I had already written. Actually Pettavaithalai is situated in between Sirugamani and Perugamani. There I got a place to sit and I enquired the co-passenger to let me know if Thirupparaithurai comes. As usual, the locality (i.e., Central TamilNadu) is filled with too friendly people and she started enquiring me about my whereabouts and why was I going to Thirupparaithurai. I just said I wanted to meet ‘Mr.Ishwaran’ (regular readers know who I am referring to. For others – Ishwaran in Lord Shiva as he is called everywhere in Tamil Nadu). I was told when we reached there and I got down and again I enquired for Ishwaran Koil. Luckily here the bus stopped just 100 m away from the temple. But I had my fingers crossed as it was already 12.00 noon and smaller temples close earlier for ‘Nadai Moodudhal’ or temple closure for noon. It’s believed that Gods take a little nap at that time. Well, not so lucky. I ended up looking at the closed Sanctum Sanctorum of Paraithurai Nathar also called Tharukavaneshwarar. It had just closed by 11:30 or so. I just walked upto the door and came out. The temple was open, except the Sanctum Sanctorum and here too was a wedding that had just taken place and the whole group was having the wedding lunch in the temple’s mandapam. On my way out I saw a little lighted room on the side. I peeped in to see if I could find someone. And ahoy I did…!!! I met Mr. Pazhaniyandi the Meikkavalar of the temple. I enquired him if I could meet the priest. He said the priest had left and enquired where I was from. When I said I was bitten by the wanderlust and came here exploring, he said he could open the Sanctum Sanctorum for me. Wow!!! I said why not and I had a nice darshan of Tharukavaneshwarar aka Paraaithurai Nathar and Pasumpon Mayilambikai aka Hemavaranaambikai. A speciality here is that in the Tamil month of Purattasi on the 18th the sunlight directly falls on the lingam in the Sanctum Sanctorum thus giving a solar prayer. I asked him the lore and legend of the temple. That’s my favorite part in temple tours. I get to know my history and the rich cultural heritage of my dear India. Well, this place was an eden of so many ‘Paraai’ trees and this forest was called Tharukaavanam. So this place is called Thirupparaaithurai and Lord Shiva here is called Tharukaavaneshwarar and also Paraaithurai Naathar. Several Rishis lived here. There were these so many Rishi Pathni’s (Wives of Rishis’) here who were extremely beautiful and the Rishi’s were too proud of their wives. And Lord Shiva cleared them off their false pride in the incarnation of Bikshadanar. The Sanctum Sanctorum of Tharukaavaneshwarar has a suyambu lingam that is it was createdby itself and not man-made. All of the Saiva Nalvar have sung hymns on this temple. This temple was built in the Chozha reign some 400 yrs back. 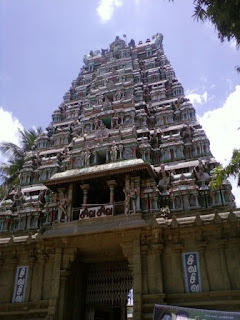 It was renovated during the Kanaadhu Kaathan time by Naagappa Chettiar. 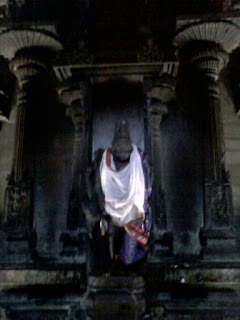 There is a sculpture of him in the Nandi Mandapam. After chatting with him and gaining so many details, I looked into the circumambulation passage. It was pitch dark in there with no lights. I gave the passage a freaky look and stared back at Mr.Pazhaniyandi. He said, ‘You may go and have a circumambulation done while I wait for you. I’ll close the temple after u leave.’ That was so sweet of him, isn’t it..??? So I sported into that dark passage. But as I went in it was not that dark. Since I was coming in from scorching sun at 12 noon, the whole interiors appeared so dark for me. It was not lighted as well. There were these occasional lights from the gaps of the ceiling. It was pleasant inside there but with no one besides in that dark surrounding, it was slightly freaky, too. As I circumambulated the east facing temple I offered my prayers to Sapthamadha on the eastern wall. 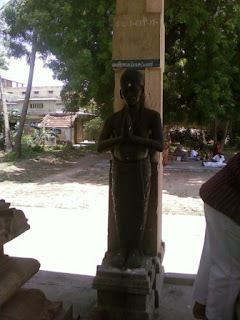 For a change, rather unusually there was a statue of Ayyanar - the village god, here. Then as usual in all Shaivaite temples, there were the Saiva Nalvar. Then I prayed Naagar, the snake God. Then I prayed Vigneshwarar and Nardhana Ganapathy in the south facing side. Then comes the specialty. 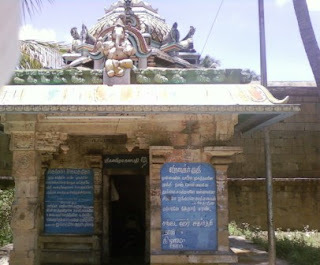 The shrine of Dakshina Murthy. Its an awesome shrine with an intricate work. The ‘Simhathoon’ pillars are exquisitely carved with lions that hold the whole pillar and the leaves on the tree behind Him were so intricate. Care had been taken to show each and every leaf than the tree as a whole. This shrine looked amazing and stood out from the rest despite of the freaky darkness and lighting that was lesser than a zero watt bulb.I think I’m gonna go this temple just for this shrine, once again. Let’s see…!!! Then on the east facing walls were the several shrines including Somaskandhar, Valli Deivanai samedha Subramaniar, and the lingams of the elements of nature – Appulingam - Water, Theyulingam - Fire, Vaayulingam - Wind. Ardhanareeshwarar was on the western side. On the northern side were Durga, Lakshmi, Mahalakshmi. 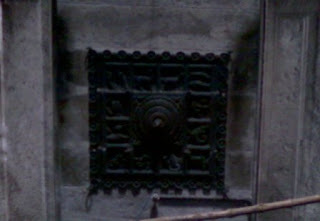 On the south facing wall were the shrines of Mahalakshmi, Gajalakshmi, and a separate special shrine for Chandikesar. Then were the Navagraha in which only Sanishwara stands with his Crow. And I was again standing in front of the Sanctum Sanctorum. There Mr. Pazhayandi was waiting for me and wondering where I had gone. A sweet and caring man he was. Then he showed me a ‘Chakra ’ – a cyclic relief on the ceiling. That was called the ‘Rasi Chakra’ or the Moon-Sign cycle. He said, if someone offers their prayer to Paraaithurai Nathar standing below their respective Moon-Sign the wishes would come true. Isn’t that incredible…??!!! I came out and circumambulated in the outer passage. As usual the whole place was green and lively. 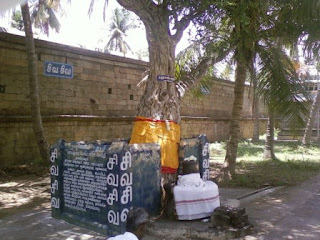 There was a shrine of Kanni Moola Ganapathy at the North-Western corner. 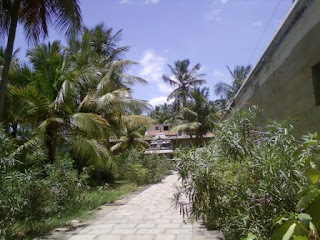 Centrally placed in the Western side was the ‘Sthala Vruksham’ or the tree of the temple ‘Paraai Maram’. There was an elegant lingam placed below the tree and the tree was showering its flowers and leaves on the Lingam. It was a pleasant and peaceful sight to keep seeing forever and feel so relaxed. There was also a man sitting there and relaxing and meditating here. Further ahead on the South-Western corner was the shrine of Sri Dhandayudhapani. At the back of my mind was the thought, ‘What if anyone in this moderately packed bus has Swine Flu’…???!!!! Frequent buses available from Trichy and Karur. Pettavaithalai is the nearest railway station. And town bus no: 97 from Pettavaithalai, drops you right in front of the temple. My first tour of Thirupparaithurai! Thanks Mitr. So jealous of your travels. Things I may never live to see, but wish that I could. I better start saving my pennys. So rich history and culture appear on these beautiful photos! Very interesting tour through the temple! Hello and thank you Mitr-Friend for your kind wishes. My neighbour went to South India to visit temples and they had a grand time. And I can picture their trip from your blog. There is so much history here. Thanks for the tour of the temple . Thanks for stopping by my blog. You have some interesting posts here about off-beat places. I'll be back to take a closer look! I liked your blog very much. I appreciate for your beautiful presentation with wonderful photos. I have visited Trichy several times as I am from Pondicherry. You have beautifully covered the temple. You are fortunate one to enter the sanctum. Even I have seen that they open the temple on request in some places for Darshana. It was wonderful to know about the history of temple. Lovely travel account. I'd love to visit this temple and the surrounding areas sometime soon. Thanks for sharing! Another fantastic temple with such an intricate architecture! 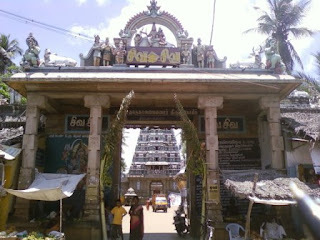 Thanks.I am searching the Lord Siva temple with Ambal Manimekalai.If know anybody pls inform me. I do not know for now. I'll try to find. Your comment is in my blog and hope someone who stumbles here might help you!!! Thanks for the Comments in my blog on Thiruppaaraithurai. I have been reading your blog since October and i had commented in one or two of your posts. Your writing is good. Keep writing. 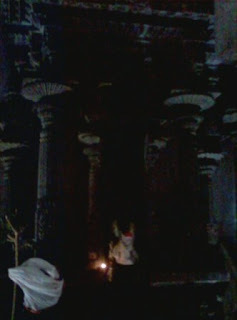 The interiors of this Temple are mostly dark.... just like most of the old temples in TN. Yeah, but some temples have electric tubelights in them now. And some have spacings in the ceiling done in ancient times itself! This one didn't not have any space in ceiling and thanks to the timing i went there, the tubes were off! Paraai tree is the tree of Kettai Natchathira. 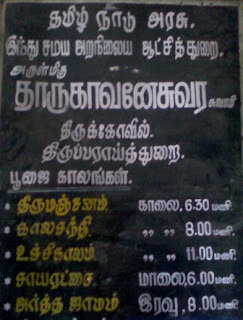 So it is Natchathira temple for Kettai people. Indeed it is, Ramesh! Thanks for your comment!